Copper and Zinc Speciation and Bioavailability in the Tamar Estuary (2012-2015). The EU Water Framework Directive places an emphasis on improving water quality with new metal environmental quality standards (EQS), some based on bioavailability. In the SW of England and other parts of the UK, the estuarine environment is influenced by significant metal inputs from river and estuarine sources, leading to elevated concentrations of metals such as Cu, Zn, Pb, Cd and Ni, and in some cases exceedances of the new EQS. 4) Modelling speciation and fate within estuarine systems. Ingredients (APIs) in regions with high water reuse (2014-2017). assess the potential to develop and validate predictive models for selected geographical locations (e.g. under varying soil types, hydrological scenarios and land use). Iron is required by marine phytoplankton for a range of biochemical functions, including photosynthesis and nitrogen fixation, and therefore is important for supporting ocean ecosystems. Input of iron to the World Ocean occurs via a number of pathways: fluvial input, melting of glaciers and sea-ice, resuspension of coastal and continental shelf sediments, atmospheric deposition of aerosols and hydrothermal activity. However, it is thought that the majority of new iron supply to the surface open ocean is through atmospheric deposition of aerosols. The proportion of total iron contained within aerosols that dissolves in seawater, the fractional dissolution, varies greatly and is influenced by the original source of aerosols, the physical and chemical composition of aerosols, the particle size of aerosols, the concentration of aerosols deposited at the ocean surface, atmospheric conditioning during transportation of aerosols and the physicochemical conditions of seawater. This three year PhD studentship will investigate the effect that a number of the above factors have on the extent of leaching of iron from aerosols once deposited into surface seawater. (1) Estimate the uncertainty associated with each of the analytical steps involved in a shipboard flow injection-chemiluminescence (FI-CL) method for Fe speciation (including colloidal Fe) in marine waters and in a laboratory ID-ICPMS method (a primary ratio method). (2) Describe all aspects of the measurement process, i.e. from the sampling step onwards, by mathematical equations, to provide transparency. This is necessary for thorough and realistic uncertainty estimations and establishing traceability to SI units of the measurement results. (3) Define a general protocol (template) for determining the uncertainty budget (derived from 1 and 2) for other trace metals that influence biological activity (e.g. Cu, Co, Mn, Zn, Pb, Hg). (4) Determine the effect of oceanic parameters (e.g. pH, ligands, loading) on the dissolution of bioavailable iron from different atmospheric dusts (e.g. anthropogenic, crustal, volcanic). Isotopically labelled markers will be used to elucidate the processes governing dissolution. Knowledge of the fluxes of bioactive trace metals (TMs) to the surface ocean is important because of their role as essential micronutrients for primary production, and due to their potential toxic effects at elevated concentrations. Deposition of TMs to the remote regions of the ocean via atmospheric transport is a primary input mechanism for these elements to the euphotic zone. However, there are limited data available to evaluate the impact of current and future changes to key seawater physicochemical parameters (i.e. pH, dissolved oxygen, organic chelates) on TM dissolution from aerosols. ‘DISCOSAT’ (Determining the Impact of Seawater Chemistry On the Solubility of Atmospheric Trace metals) will test the principal hypothesis that changes to these physicochemical parameters have a significant impact on the dissolution of TMs from aerosols. 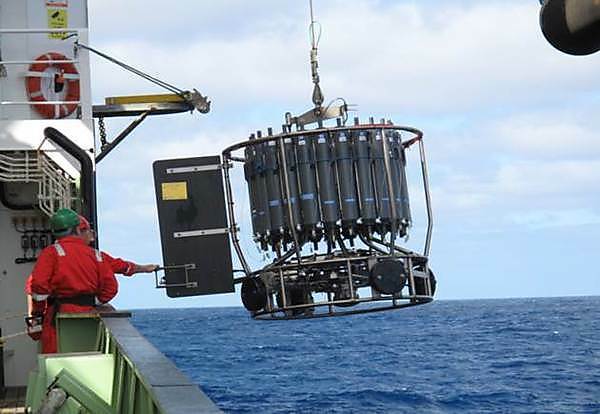 The project will also allow the comparison of the dissolution of metals from subtropical and temperate marine aerosols in the North Atlantic by sampling the marine boundary layer at the Tudor Hill facility in Bermuda and the Mace Head facility run by the National University of Ireland Galway.